If you’re in to music and like listening to music on speakers instead of headphones this is as good as it gets. The Smart Gear HoverBEATS provide good range Bluetooth which works perfectly. It has a pair of built-in speakers and cool flashing led lights. Its light weight makes this an excellent choice for children. Package contains: Charger, User manual, Package box, Carrier bag INCLUDED. Things are moving fast in the hoverboard genre and therefore we’ve updated our list of the best bluetooth hoverboards where you can find the most anticipated models and an up-to-date list of hoverboards with speakers and bluetooth connectivity. The hoverbeats from SmartGear isn’t available for purchase anymore due to UL certificates needed. 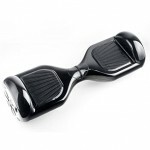 You can check out our review of the powerboard however which is one of the top sellers right now. US brand, shipping from within the US and good support/service available. Music, Even though at first this was a bit distracting. When you get used to it, it rocks! Lights, The lights are amazing on this scooter. There are bright flashing led lights along each fender and front flashing to the music. Charge time, 1.5 hours recharging and 50 mins to 80% is just fantastic. Bumpers, It didn’t have any bumpers so we recommend that you learn to ride inside first to evade a few scratches. Price, For the speakers and the flashing super cool led lights there is a downside. The price tag on this device is pretty high. With that in mind we knew we were in for a treat before we even had gotten our HoverBEATS electric hoverboard. It arrived within a week and I has a really cool design. We instantly put this scooter to the test. We started out by just taking it for a stroll and it did what it’s supposed to do. I hook it up with my Iphone through Bluetooth and put some music on. The build-in speakers aren’t exactly hi-fi but they did good. It was my first time on a music playing balancing scooter and I must say at first it felt a bit distracting. I started moving along with the music and started to turn unintentionally almost making me lose my balance entirely. Gladly this was just a phase, after a song or two I started to use the hoverboard correctly again. I have to say some loud music while hovering around on a new smart electric balancing scooter wasn’t bad at all. At least that’s what I thought, until I started to look around and see all these eyes staring at me. It might have been because of the board itself but I am used to those eyes. This was something else, maybe they didn’t like my taste in music. I will never know, but in case you buy one of these. Make sure you don’t play any offensive music! No Hip Hop/Rap at all I would say. It has bright flashing led light along each fender making it look really cool. It took us somewhere around 20 kilometers with a fully charged battery. It took us 1.5 hours to fully recharge the battery again. This is a lightweight scooter, one of the lightest on the market only weighing 9.2 kg. It was easy to move around and to just pick it up and go was no problem at all. This makes it perfect for older adults and retirees wanting a new adventure. It has decent sized tires of 8” which gives you a 3cm ground clearance giving you enough space to run over stones and other smaller obstacles. Overall this is a great scooter. They call it the safest 2 wheel balancing scooter and I have to admit that you feel entirely safe while riding it. A tip is to learn to ride it first without the music as even I who have a lot of experienced with these scooters felt that the music was somewhat distracting in the beginning. If you’re interested in a more groundbreaking hoverboard then you should have a look at our top reviewed hoverboards list here.